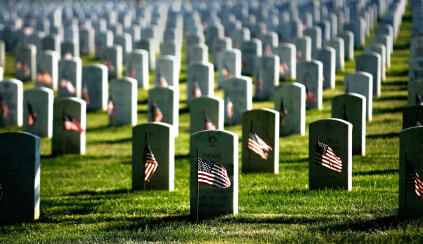 Small US flags wave in the wind after being placed in front of headstones at Arlington National Cemetery during the Flag-In Ceremony ahead of the Memorial Day weekend May 24, 2007 in Arlington, Virginia. May 28: NBC's Jennifer Johnson reports that the sacrifices of our armed forces, both past and present, were honored at home and abroad this Memorial Day. Jacobs: Have we forgotten the meaning of Memorial Day?